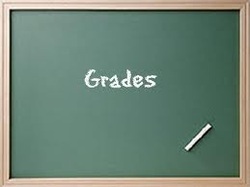 I think it's important for students and parents to know what the grade they are receiving means. Different teachers take different factors into account when establishing a student's final grade, and I try to explain that below. 1. How well has the student met the standard of quality? Whether the skill is writing an essay, giving a persuasive speech, or analyzing literature, in each course students are expected to reach a certain skill level. Many of these skills are practiced and developed every year students are in a language arts course, but we ask a different level of quality or depth as the student progresses. Part of their grade reflects where they are in terms of that standard of quality. 2. Has the student fulfilled course requirements? A certain amount of course work for each class is required, and a student's grade also reflects whether or not they completed that course work. Therefore, a student's skill level at reading may be high, but if they don't complete the required reading for the course, their grade will reflect that. The same goes for the other language arts skills that we focus on. A huge part of language arts is developing these skills (reading, writing, speaking, thinking, viewing, and listening) through practice as well as acquiring the skill and desire to consistently develop through practice. The required course work is designed to help them with that goal, which is why I use it in determining their final grade.